Make sure to watch the video until the end! No need to call the Ghostbusters this time, folks. Instead, we have four versions of Luigi teaming up to take on this spooky skyscraper themselves. Nintendo continues to educate us about Luigi’s Mansion: Dark Moon’s 4-player co-op modes with a special walkthrough video and featuring a surprise guest. The 4-player co-op modes in Dark Moon include: “Hunter”, “Rush”, “Polterpup”, and the newly revealed “Surprise” mode. Essentially, “Surprise” is a mode randomizer for your co-op game sessions, choosing a random mode per each floor. This, along with the “Endless” setting, are unlocked when playing the Single-Player campaign and can be toggled on and off. This feature is fantastic for extended play sessions that want to be kept interesting by switching things up. Catching this rouge ghost mutt is tougher than you'd think. “Rush” forces players to quickly reach the end of the stage, adding extra time to the countdown clock through Time Pieces. 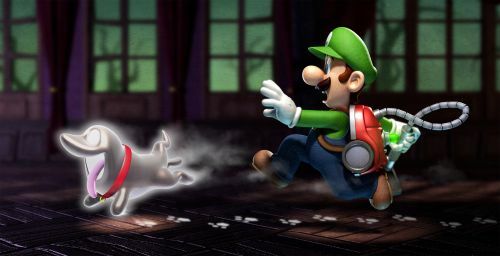 The lovable “Polterpup” mode has players tracking down ghost doggies by using the Darklight mechanic and following ecto paw-prints on the ground. Another in-game mechanic called “Red Coin Scramble” happens at the end of a stage. Players must search for hidden Red Coins, collecting all of them will give out a bonus reward. So far, we like what we see! 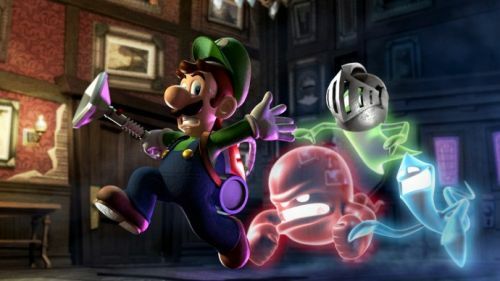 Luigi’s Mansion: Dark Moon will be available for the 3DS on March 24th via retail or the Nintendo eShop. Page created in 0.8109 seconds.